Portland, Ore, February 27, 2018 — Agile Alliance, a global nonprofit organization committed to advancing Agile development principles and practices, today announced that the Agile Alliance Board of Directors has elected officers for the 2018 term. The board — comprised of Agile thought leaders from a variety of backgrounds and countries — shares its passion to deliver software better every day with Agile professionals around the world. 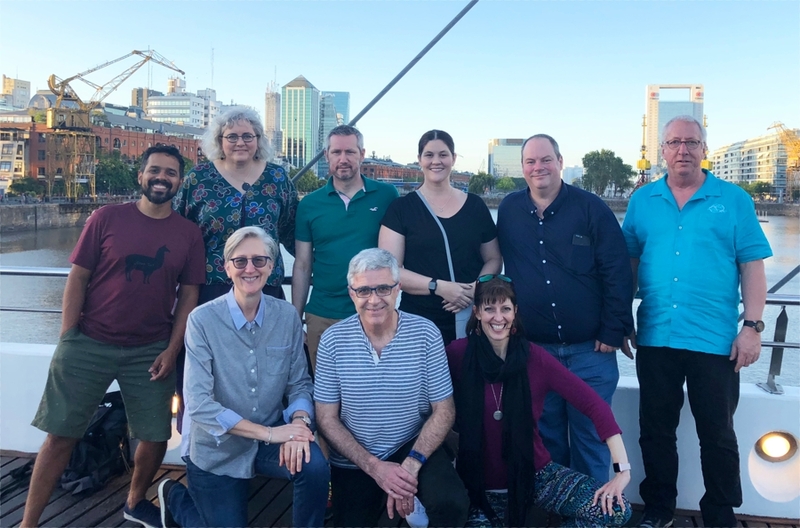 This photo was taken in February, 2018 during a face-to-face meeting of the Agile Alliance Board of Directors in Buenos Aires, Argentina. Back, l-r: Victor Hugo Germano (Treasurer, Brazil), Ellen Grove (Canada), Paul Hammond (England, Chair), Tricia Broderick (USA), Craig Smith (Treasurer, Australia), Phil Brock (Managing Director, USA). Front, l-r: Heidi Musser (USA), Declan Whelan (Canada), Becky Hartman (USA). Not pictured: Juan Banda (Bolivia). Paul Hammond, Chair (England): Paul is a 20+ year veteran of the software industry and has been leveraging Agile principles and practices to deliver software for more than ten years. He heads eBay’s European Product Development team. As a senior engineering leader, he is passionate about growing and leading large geographically dispersed Agile development teams. Victor Hugo Germano, Treasurer (Brazil): Victor is a Brazilian entrepreneur and co-founder of Lambda3, where he helps teams and companies utilize Agile processes and values to better deliver products. The company’s vision is to create an organization with a democratic workplace where participation, responsibility, and transparency are keys to success. Craig Smith, Secretary (Australia): Craig Smith, Agile Coach and Director at Unbound DNA, has been active in the IT industry for over 20 years and has been an Agile practitioner, coach, and trainer for over 10 years. Craig helps organize the Agile Brisbane Meetup Group and is the director of YOW! Conferences. He has presented at numerous Australian and international conferences, is an Agile editor for InfoQ, and co-hosts a podcast called “The Agile Revolution”. Agile Alliance is a nonprofit organization dedicated to promoting the concepts of Agile software development as outlined in the Agile Manifesto. With more than 48,000 members and subscribers around the globe, Agile Alliance is driven by the principles of Agile methodologies and the value delivered to developers, organizations and end users. Agile Alliance organizes and supports events to bring the Agile community together on a global scale.